After the Curtins moved to Cottesloe, Elsie played an active role in the Fremantle Branch of the LWO, including holding the office of Treasurer. 39 Like many other women in the labor movement, her management of the family finances was merely extended by taking on the office of treasurer of the various ALP committees. Also like her contemporaries, Elsie's interests extended well beyond the ALP into community welfare work and cultural interests. When the media 'discovered' Elsie in 1935 at the time of her husband's election to leadership of the ALP, she was invariably announced as a woman who 'likes home life', 41 'home loving' and 'a silent partner'. 42 Sometimes her early interest in politics in Cape Town and Hobart was mentioned, but almost never her commitment to the Western Australian Labor movement. 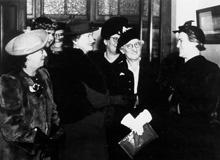 During the six years that Curtin was ALP Leader and Leader of the Opposition in the Federal Government, Elsie Curtin gave a number of interviews, in which she reiterated that 'home duties' kept her from being very active in public life, yet as we have seen, she was active in the labor movement and in other groups in the community. One of the few interviews to quote Elsie's views, by a reporter from the Adelaide newspaper The Mail in October 1935, depicted Elsie as 'petite, grey-haired and brown-eyed' and described her as spending her spare time reading in 'her little lounge room surrounded by books'. In this interview, Elsie stated that freeing people 'from the fear of poverty' and enabling them to be 'certain of at least necessities of life' would give her 'a thrill'. While 'delighted' that her husband had been elected leader of the ALP, she knew that it would mean less time at home for him. Even after Elsie and John had left school and entered the workforce, their mother felt this same sense of duty. When John joined the RAAF at the beginning of World War II, it was important to Elsie to maintain the home in Cottesloe as a place to which he could return on leave from his station in Geraldton. Delegates to the Conference of Western Australian Labor Women outside Museum & Art Gallery, Elsie Curtin 4th from left, front row, October 1927. Elsie Curtin at Labor Congress, 1941. Fremantle Labor Women's Group (including Elsie Curtin) at Fremantle Trades Hall, celebrating John Curtin becoming Prime Minister, 14 October 1941.